As one of the most beautiful countries located along the coast of the Arabian Gulf, Kuwait’s status as both an economic guru and a tourist attraction famous for its modern architectural wonders has been growing exponentially over the last few decades. Thus, it is no wonder that the world is looking forward to Madinat Al Hareer (translated to Silk City), the Kuwait’s future city that is now under construction. Conceptualized as a solution to Kuwait’s growing overpopulation issue and overloaded infrastructure, Madinat Al Hareer is also expected to boost the Kuwait’s already strong economy (the Kuwaiti Dinar is currently the highest valued currency in the entire world) through the investments it is going to attract by its multi-purpose nature as it is predicted to provide around 450,000 new job opportunities. Being constructed over the total area of 250 square kilometers in Subiya, Madinat Al Hareer is planned to be built in individual phases to be completed within 25 years with an estimated cost of 132 billion dollars; a cost that led to branding the silk city as one of the most radical and most expensive constructional projects in the region. The city will be connected to Kuwait city via the Jaber Causeway which is still under construction, and it is highly anticipated due to the numerous attractions it is going to comprise upon its completion. 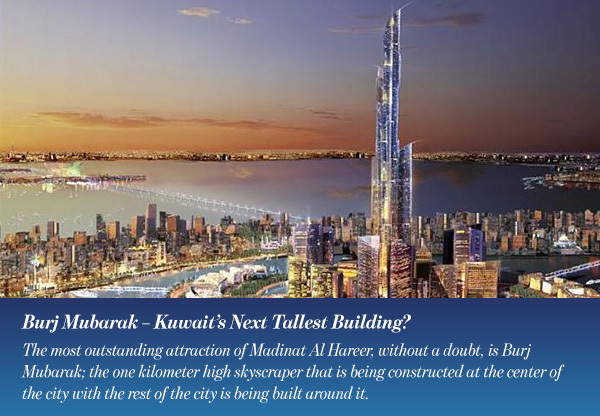 Burj Mubarak – Kuwait’s Next Tallest Building? The most outstanding attraction of Madinat Al Hareer, without a doubt, is Burj Mubarak; the one kilometer high skyscraper that is being constructed at the center of the city with the rest of the city is being built around it. While Madinat Al Hareer is expected to be completed in the year 2023, the mixed-use megatall building is estimated to take around 25 years to be finished with a height of 1,001 meters (the number is said to be an intentional tribute to the all-time famous folk tales’ collection 1001 Arabian Nights) and is going to comprise 234 floors with the capacity to house 7,000 people. The construction of Burj Mubarak will be commenced once the Jaber Causeway is complete. It would be the tallest building in Kuwait, and it is safe to say that its planned height surpasses that of the world’s current tallest building – Burj Khalifa in Dubai (828 meters). However, it is not the world’s tallest under-construction building at this moment. The tower will consist of 7 vertical villages that include hotels, residences, offices as well as entertainment amenities. As impressive as the tower is, its concept does pose equally difficult challenges in its design and implementation. For example, it is common knowledge among architects that the taller the building is, the more elevators it is going to need and with a building that is one kilometer high, including enough elevators for the residents would be uneasy, to say the least. Experts suggest that incorporating double decker and triple decker elevators into the tower would be a necessity to overcome that obstruction as they would be more efficient than the conventional elevators. Another considerable challenge that the tower’s implementation would face is the strong high wind at the top of its high structure. To overcome this challenge, Burj Mubarak will be designed in the form of three interlocked towers that are each twisted 45 degrees to preserve the structure’s stability. In addition to that, adjustable vertical ailerons will be run along the entire height of the building at each of its edges to minimize the vibrations the wind will inflict on the tower’s structure. 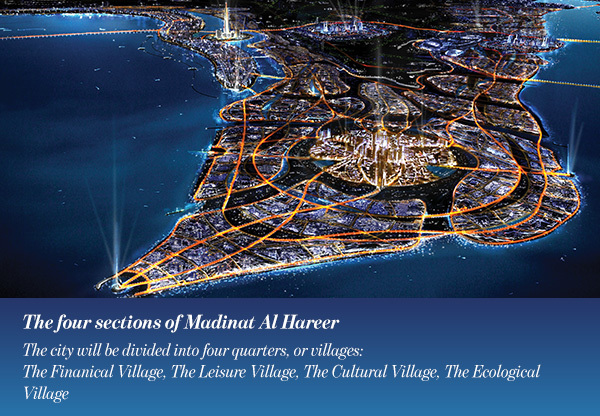 With the capability of housing up to 700,000 people, Madinat Al Hareer is going to comprise multiple other attractions like an Olympic Stadium, nature reservation area over the area of 2 square kilometers, a new airport and a duty free area in addition to multiple amenities including business, leisure, athletic and environmental areas and conventions. The Finanical Village: located right in front of Kuwait city and near the new airport, this section of the project will comprise the business center, conference halls and amenities and it is planned to be an important center for international and regional trade flow. The Leisure Village: located near the canal that connects the Arabian Gulf to Dijla and Al Furat rivers, this section of the project comprises hotels and resorts, as well as a world-class sports academy, a medical center and a marine sports’ center. The Cultural Village: this section of the project comprises three districts: the academic district, the diplomatic district and the political district. The Ecological Village: located at the centre of Madinat Al Hareer and spanning 45 square kilometers, the ecological section includes national parks and reservations for wild animals and rare planets as well as nature reserves for immigrating birds from central Asia and Africa. In addition to the above, the ecological village will include a center for environmental studies and vast green spaces. On the other hand, the whole Silk City will be surrounded by a green belt of gardens and vast green spaces to guarantee the visitor an unpolluted atmosphere for his visit. With its very huge budget, Madinat Al Hareer still has a long way to go. This means that there will be probably more developments and addition to the project to add even more to its promising capacity and potential.